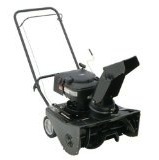 The Murray 21 Inch Single Stage Snow Blower is the introductory snowblower from Murray. It is powered by a Briggs and Stratton Snow Series 4 stroke engine. As the engine is a four stroke, this means that you never need to mix oil and fuel yourself. Instead you can just add them separately to the snowblower and the engine will do the mixing itself. This 0.19 liter engine provides the Murray single stage snow blower with 6.5 ft-lbs of torque. The fuel tank for this snow blower holds up to 0.95 liters (0.25 US gallons) of gasoline, which will keep the snow blower going for more than an hour without it needing to be fueled up. Like most single stage snow blowers, the Murray 21 inch snow thrower does not use it’s wheels to move forward. Instead it uses it’s auger. The auger is positioned so that it comes into contact with the ground as it rotates. As the auger spins so fast, it powerfully pulls the snowblower forward. Because the auger is consistently making contact with the ground, it could potentially damage the surfaces it’s supposed to be clearing if it were made from a hard material like steel. Luckily though it is made from rubber so it never leaves a mark. The diameter of the auger on the Murray 21 inch single stage snow blower is 0.2 m (8 inches). The auger powerfully breaks up the snow and forces it through the chute and away from the clearing area. The chute that channels the snow is made from plastic to help prevent blockages during operation. The chute is able to rotate through 180 degrees so that the operator is always able to find a position that is optimal for getting snow off the surface being cleared. This snow blower weighs in at an amazingly light 44 kg (97 lbs). Click Here to buy the Murray 21 Inch Single Stage Snow Blower.